A base glaze is one having no opacifiers, variegators or colorants. Thus it should be transparent if glossy and translucent if matte. Developing or adapting a base glaze for your ware is a very important first step in developing a manufacturing process that produces good quality. In fact, from a quality point of view, it is much better to have a base transparent plain glaze that is functional, durable and adjustable than to have a reactive more visually interesting one that is not. The reason for this is that the additives in the latter can be transplanted into the former so that you can have it all! To melt well enough low temperature glazes need a powerful flux and boron is almost universal. Base clear glazes for low temperatures normally contain high percentages of frit (up to 90%), the rest is clay to suspend it. Gerstley Borate is often used to source boron instead however it causes glaze slurries to gel excessively in the percentages required for low fire. Boron has a low thermal expansion also, this enables much flexibility in adjusting the expansion of glazes to fit clay bodies. At high temperatures mixes feldspars, calcium carbonate, dolomite, talc and other natural flux-oxide sources combine with clays and silica to melt very well as a mix (frits are normally not needed). Much higher percentages of silica and alumina are possible so, like low fire, it is not difficult to keep thermal expansion down and control glaze fit (especially prevent crazing). The lesser percentages of fluxes needed makes it easier to produce base glazes that resist leaching and are more durable. However raw materials (as opposed to frits) produce more gases of decomposition, so it can be difficult to produce crystal clear glazes in raw high temperature glazes. Industry has found ways to fire ware much faster in recent years, this makes it feasible to fire to high temperatures. To get flawless glaze surfaces they employ frits. Middle temperature is where most potters do their work. More powerful fluxes are needed than for high fire, boron is the principle one used. Gerstley Borate appears very widely in recipes for this reason, but in much lower amounts that low fire glazes (notwithstanding this cone 6 base clear glazes can have as much as 50%!). But frits are the best source of boron. Zinc, lithium and strontium are also employed as auxiliary fluxes. Middle temperature base glazes, because they have less low expansion SiO2 and Al2O3, are prone to crazing, especially where high levels of feldspar are present (which is very common). 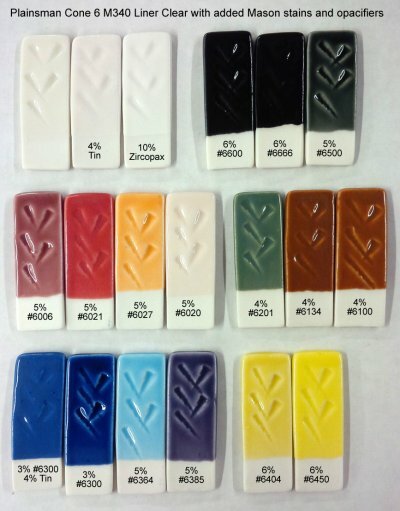 It can be tricky to find a balance that produces a glaze of low enough expansion that still melts well, this underscores the importance of fine tuning a base recipe that fits well and using it as a home-base for color and character additions. Once you achieve a stable, middle-of-the-road transparent base glaze then you are in a position to add an opacifier and glaze toilet bowls! But likely you want more. While everyone needs quality liner glazes, such bases do not easily produce the more interesting variegated surfaces. It is necessary to develop adjustment strategies whereby the glaze can be made more fluid in the kiln so that variegators and colors dance more within it. Experimentation is needed to learn to increase the fluidity while still keeping the thermal expansion down and the durability sufficiently high. 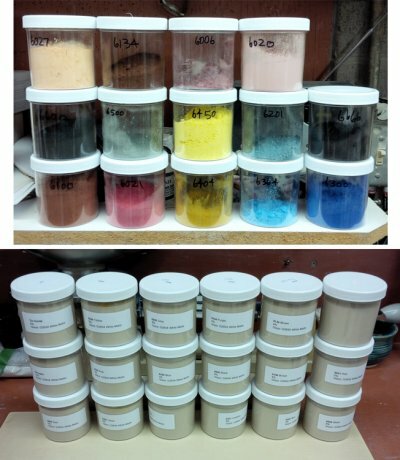 It is also needed to learn which colorants are impacted by the chemistry changes needed to get the extra fluidity. Experience is needed to learn how to apply such glazes such that they do not run off ware onto the kiln shelves. This is still a testament to the wisdom of the base-glaze-with-adjustment approach. 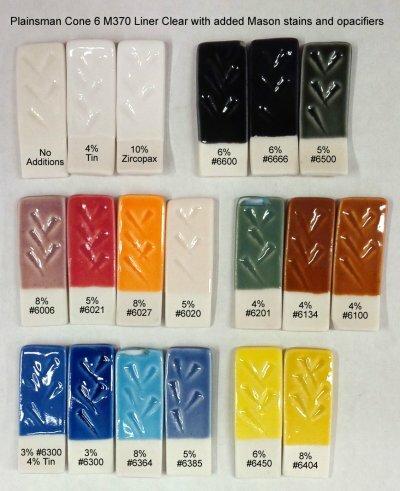 A well documented testing program to understand how to adjust your base glaze will be one of the best investments in time you can make for your ceramic production. A super glassy ultra-clear brilliantly glossy cone 6 clear base glaze? Yes! 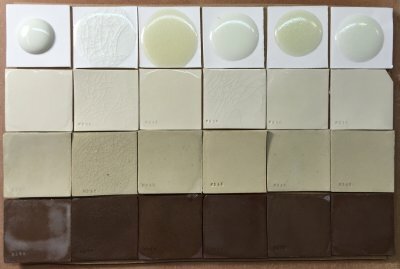 I am comparing 6 well known cone 6 fluid melt base glazes and have found some surprising things. 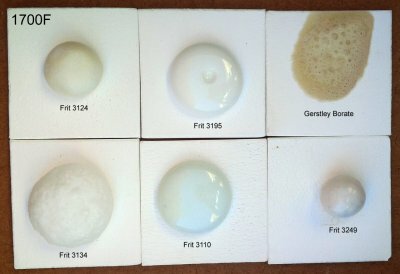 The top row are 10 gram GBMF test balls of each melted down onto a tile to demonstrate melt fluidity and bubble populations. Second, third, fourth rows show them on porcelain, buff, brown stonewares. The first column is a typical cone 6 boron-fluxed clear. The others add strontium, lithium and zinc or super-size the boron. They have more glassy smooth surfaces, less bubbles and would should give brilliant colors and reactive visual effects. The cost? They settle, crack, dust, gel, run during firing, craze or risk leaching. In the end I will pick one or two, fix the issues and provide instructions. This is Plainsman translucent Polar Ice firing at cone 6 with a transparent base glaze. Made by Tony Hansen in 2014. There are thousands of ceramic glaze recipes floating around the internet. People dream of finding that perfect one, but they often only think about the visual appearance, not of the usability, function, safety, cost or materials. That resistance to understanding your materials and glazes and learning to take control is what we personify as the dragon. Using the resources on this site you could be fixing, adjusting, testing, formulating your own glaze recipes. Start with your own account at insight-live.com. A good base glaze, a vitreous clay and a good fit. How good that is! 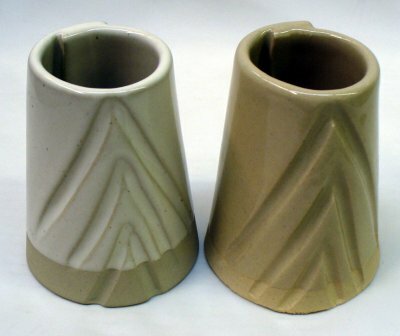 Left: Cone 10R buff stoneware with a silky transparent Ravenscrag glaze. 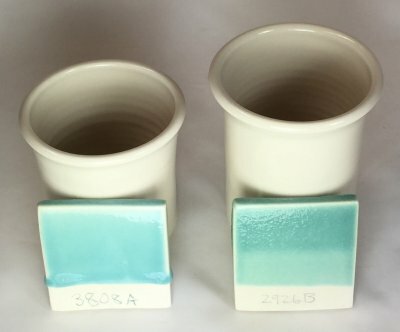 Right: Cone 6 Polar Ice translucent porcelain with G2916F transparent glaze. What do these two have in common? 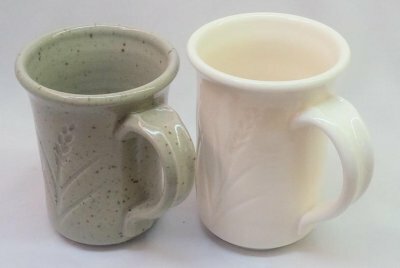 Much effort was put into building these two base glazes (to which colors, variegators, opacifiers can be added) so that they fire to a durable, non-marking surface and have good working properties during production. They also fit, each of these mugs survives a boil:ice water thermal shock without crazing (BWIW test). And the clays? These are vitreous and strong. So these pieces will survive many years of use. Two bases, 2% copper additions. Which is the better transparent? Wrong. It is the one on the right. While the copper looks so much better in that fluid one on the left, that melt mobility comes at a cost: blisters. As a clear glaze it is no glossier than the other one, but it runs into thicker zones at the bottom and they blister. This is because the high mobility coupled with the surface tension blows bubbles as gases of decomposition travel through (in a normal cooling kiln they break low enough that mobility is insufficient to heal them). The fired glass in the one on the left is also not as hard, it will be more leachable, it will also craze more easily and be more susceptible to boron-blue devritrification. But as a green? Yes it is better. Trafficked online recipes waiting for a victim to try them! 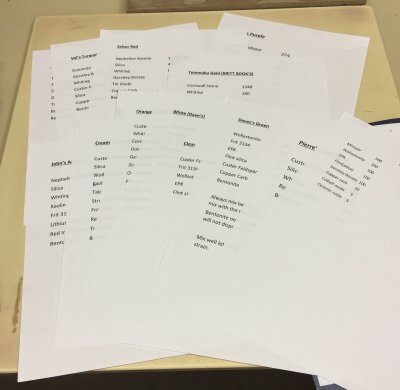 Last week a customer came to buy materials to mix these recipes she found online. Then we had a closer look. Many have 50+% feldspar/Cornwall/nepheline with little dolomite or talc to counteract their high thermal expansion, these are guaranteed to craze. Many are high in Gerstley Borate, it will turn the slurry into a bucket of jelly. Some have high tin, lithium and cobalt; exceptionally expensive materials. Many have metal carbonates, which can produce blisters and bubbles in the fired surface. Some contain almost no clay, they will settle like a rock in the bucket. A better way? Identify the mechanisms (colorants, opacifiers and variegators) in each and transplant these into your own base transparent glossy and matte recipes. These already fit your bodies, have good slurry properties and are stable. Use stains instead of metal oxides when possible. 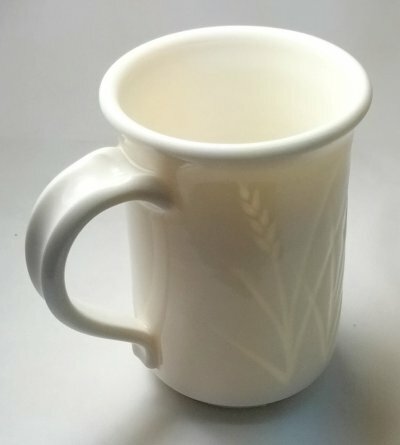 Reliable widely used base glaze for cone 10 porcelains and whitewares. The original recipe was developed from a glaze used for porcelain insulators. A base fluid-melt glaze recipe developed by Tony Hansen. With colorant additions it forms reactive melts that variegate and run. It is more resistant to crazing than others. 2015-09-30 - This is a test to publish Insight-live data here. Many more recipes coming soon. It is better to understand and have control of one good base glaze than be at the mercy of dozens of imported recipes that do not work. There is a lot more to being a good glaze than fired appearance.